And a notice for my A/B measurements. This splitter for me has a great advantage over the typical splitters found in electronics stores: Several headphone plugs are quite thick and do not allow other plugs to be inserted on the splitter . two of the splitters I have tested so far made short connections and finally offered monophonic audio in both ear[/head]phones . 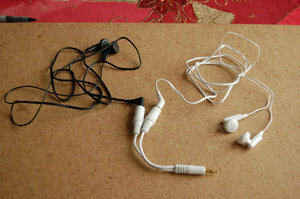 1.A stereo audio is heard as a line between the two ears. 3. Any differences in a monophonic audio that moves this point towards the leftor the right ear can mean higher audio to the bud in reference..
3a.With this I can also define abot the point of ‘concurrence’. Αναρτήθηκε από Zach Liang στις 11:06 μ.μ.